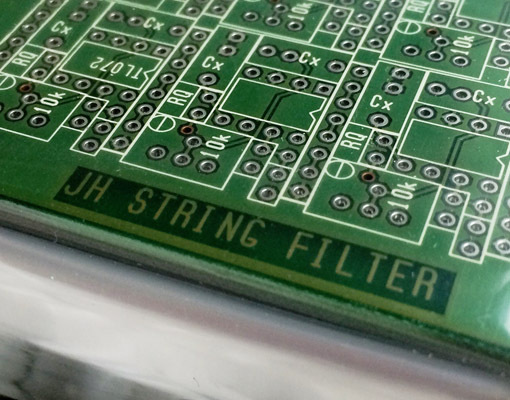 As I've received a number of questions regarding the availability of the Haible String Filter pcbs, I'm contemplating to do a re-run of the original String Filter board if there is enough interest (similar to the re-run of the Vocoder pcb). That means a new production based on the original files (= no changes at all), made in Germany as the original boards. Price is expected to be EUR 27 per pcb. other original Haible "vintage" boards (new old stock) are now available here. Check. Count me in for sure! Great suggestion Ralf, I'll take one. Did you know you can ping these with triggers? I added a group of gyrator EQ circuits when I built a couple of these (similar to the "Performer" EQ section of JH's rack build). Extra input and atten for feedback style patches, too. High settings of Res can result in a reverb-like effect. Yes, I love this JH design! I would buy at least one set. Great news! Definitely, I am in for two sets. I'm in for one set. I hope you'll do the Triple Chorus soon, as well. I don't expect to get the sound of real string instruments (this needs some physical modeling of the bow/string system at least!) , but I want to gain some "organic" quality for otherwise electronic sounds. I'm interested in a pair of PCBs but probably won't have the cash until the end of March or end of April. wow, count me in for two! I know, but I want a new run, with tested and supported boards. Great, I'd definitely take one set. Why not? I'm in for a set. Anyone planning on making panels? But I think the PCB's are going to be quit large.. The original boards have been tested working. I've just built one, no problems whatsoever. I would like a set (2 boards, 1 complete filter). I'm in for a pair of boards. Or is R*S supplying panels? Since the string filter needs such a large panel space and 2 PCBs are required, would it be better to have the new run on a single PCB? If I understand correctly JH's schematics the Performer EQ and Cello/Viola/Violin Filters are not part of these 2 boards, so the panel will be pretty simple : 5 pots, 4 toggle switches, 4 jacks (unless you want to go down the 40-slider road... ). If I understand correctly JH's schematics the Performer EQ and Cello/Viola/Violin Filters are not part of these 2 boards, so the panel will be pretty simple : 5 pots, 4 toggle switches, 4 jacks (unless you want to go down the 40-slider road... :deadbanana: ). 4 pots (input, res, cv, spread). And for those who didn't follow the E-M thread, the spread control is incorrect in the schematic, but correct in the wiring diagram. A batch of String filter boards should get here tomorrow.